One can say of this master that he created a genre: the “parisianism”…he is, in effect, the painter of Paris par excellence ; no different aspects of the city, often momentary and fleeting, and none of his successive transformations, is of any secret to him. The vigor of his colors, as well as in the brilliance of his mornings and of his afternoon sun, such as the mists of his twilights, is of a correct observation, that still enhances the conscientious study of the environment. The artistic period of the latter half of the nineteenth-century in France was one of modernity and contemporaneity – its most salient representation found in the paintings and graphic arts of the period around the Belle Époque (1890-1900), and continuing in well into the twentieth-century. Toward the end of the century, France’s dramatic industrial, technological, and economic changes brought about significant transformations to the social environment, and writers and artists from Charles Baudelaire and Emile Zola, to painters such as Luigi Loir and Jean Béraud, recognized the importance in representing the modern-day scene. But the differences between these two artists, and the characteristic of Loir, was the distinguishing attention he gave to the environment. It was Béraud who “paints the Parisians of Paris,” but Loir who “paints the Paris of the Parisians.” (C.-E. Curinier, Dictionnaire Nationale des Contemporains, Vol. II, Paris: Office l’Édition, 1899, pg. 300) Loir was the “landscape artist of Paris,” (Album Mariani), an artist of his times, admitting an interest in depicting the everyday street scene of contemporary Paris while simultaneously promoting the acceptance of advertising as an art form. His work typified the interests of this period in the closing decade of the nineteenth-century when artists found inspiration in the commercialized and glamorous urban environment, while nevertheless seeking out its dichotomies as well. Luigi Aloys-Francois-Joseph Loir was born on January 22nd, 1845 in Gorritz, Austria. Luigi’s parents were of French origins, but his family lived in Austria as employees of the French royal family, the Bourbons – his father was a valet while his mother was a governess. In his catalogue raisonnée on Luigi Loir, Noé Willer explains how “since the French Revolution, Gorritz (which was known as ‘the Austrian Nice’) was a refuge for royalists and particularly the Bourbon branch of the family.” (Luigi Loir, 1845-1916 : Peintre de la Belle Époque a la Publicité, Vol. 1, Carmel : Classic Art Gallery, 2004, pg. 9) The earliest years of Luigi’s life, then, were spent in the Gorritz castle, but shortly after his birth, the Loir family relocated, along with the Bourbon family, to the Duchy of Parma, around 1847. In 1860, Luigi’s family, including his sister, returned to France after the Bourbon family was forced out of Parma. Luigi remained in Parma and began studying painting at the Academy of Arts. Three years later, his father fell sick and he moved to Paris to be with his ailing father and the rest of his family. It was his first experience in the city that would inspire his scenes for the rest of his career. …understands the sites; he likes the twilights in them; he studies all of their aspects. His canvases give off the reflection of a faithful mirage, of a conscientious study of urban nature. There is a dilettantism of a stroller and the contemplation of a poet in him. One feels that all of his impressions are real and that he only paints them while under a spell. His interest in the urban cityscape is perhaps more complex than a simple depiction of Paris and its inhabitants. Loir’s sincere reflections on the changing effects of both the different times of day and the weather, show the aesthetic reflection put into his paintings. Mariani wrote that “Where his brush excels is in the rendering of the effects of the snow, the settings of the sun, and the banks and waves of the Seine.” (Album Mariani) Loir’s often impressionistically-executed works exhibit qualities of a dedicated study of the changing light effects on the environment, from the early afternoon to dusk, allowing him to focus his audience’s attention on a source of light punctuating the otherwise cool colors of the canvas. His use of the most recognizable icons of the city nevertheless created a sense of nostalgia for these urban monuments. Loir was an active Salon artist, debuting in 1865 with A Villers (At Villers). From this point on, he began regularly exposing scenes not only based on the Parisian cityscape, but other locales as well, including Puteaux, Bercy, Auteuil, and others. Indeed, at the time of his first Salon entry, Loir was not living immediately in Paris, but instead on the outskirts in Neuilly-sur-Seine. He received many awards for his entries (3rd class medal – 1879; 2nd class medal – 1886; Gold medal – 1889 Exposition Universelle in Paris) and his works were purchased by prestigious individuals and museums alike. In 1875, Jules Ferry purchased La Porte des Ternes (ENGLISH); in 1882, the St. Louis Museum of Art purchased Le Pont d’Austerlitz (The Austerlitz Bridge); in 1883, a Russian museum purchased Le Point-du-Jour a Auteuil (The Pont-du-Jour at Auteuil); in 1893 the State purchased Avant l’Embarquement (Before Embarking) for the Musée de Bar-le-Duc; among countless others purchased either by the French states or other museums spanning the continents. During his lifetime, his work was featured in many other museums such as in New York, the Musée d’Auxerre, the Musée de Nantes, and the Musée du Luxembourg in Paris. Apart from his paintings, Loir was more publicly known for his hundreds of graphic designs for commercial advertisements, book and music illustrations, menus, and to complement this already impressive array of designs, he also designed theatrical decorations. Loir’s use of the newly invented chromolithography technique allowed for large-scale, colored images to be widely disseminated. Loir was sufficiently recognized as a talented graphic artist, to the point where he was commissioned to design the official exhibition cover of the 1900 Exposition Universelle in Paris. This was also during the period in which the print established itself as a true art form in and of itself, despite its overtones of commercialism. Loir, alongside such other influential and well-known poster artists as the early Jules Chéret and the Art Nouveau poster artist Alphonse Mucha, revolutionized the art of the poster. His awards were equally numerous, becoming part of the Office d’Académie in 1889 and a Chevalier de la Legion d’Honneur in 1898. 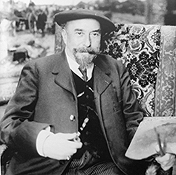 He was also a member of the Société de Peintres-Lithographes, of the Société des Aquarellistes, and a member of the Jury of the Société des Artists Français and of the Société des Arts Décoratifs since 1899. Loir remained active in painting and the graphic arts until the very end of his life. His last Salon entries were in 1914 when he exhibited Crepuscule (Twilight), Coin de Paris, Neige (Corner of Paris, Snow), Pres du Pont de l’Alma, Crépuscule (Near the Alma Bridge, Twilight), a watercolor, and A Boulogne-sur-Mer (At Boulogne-sur-Mer), a gouache. He died on February 9th, 1916 in Paris. Luigi Loir embraced Baudelaire’s call that artists represent the contemporary environment. His style suggested an interest in the Impressionist movement while his theme was similar to many Naturalist artists. Loir’s influence can be seen in two very popular artists of the mid-twentieth-century: Antoine Blanchard and Édouard Cortes whose Parisian street scenes appear in striking relation to the art of Luigi Loir. Perhaps these two artists looked back upon Loir’s art to find their own inspiration. Paintings by Luigi Loir can now be found at the Musée des Beaux-Arts of Bordeaux (Aux Lilas), Rouen (La Crue de la Seine de Paris), (Mesnilmontant), and the Musée Crozatier in Le-Puy-en-Valey (La Seine en Décembre 1879). The biographical details in this biography have been taken from Noé Willer’s previously cited catalogue raisonnée on Luigi Loir, Luigi Loir, 1845-1916: Peintre de la Belle Époque a la Publicité, published in 2004 for the Classic Art Gallery in Carmel, California, in addition to C.-E. Curinier’s Dictionnaire National des Contemporains, Vol. 2, Paris: Office General d’Éditions, 1899, pg. 300.